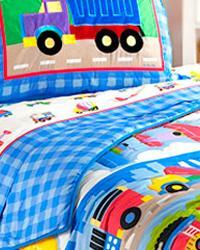 Kids bedding collections focus on themes your children will love. We have little girls bedding collections sure to please little girls, such as mermaids, butterflys, Oopsy Daisy, tea party, and more. For little boys you can find a variety of themes including: camouflage, under construction, cowboys, planes, trains, trucks and other puppy dog tail things. As your children grow into teenagers you might look at some of the teen bedding sets, such as Mod Squad, Isabella, Sports and English Rose Garden. Whether you are looking for teen bedding, boys bedding, or girls bedding we have kids bedding sets to please girls and boys of all ages. This great variety of bedding includes quilts, comforters and duvet covers along with accent pillows, shams and bedskirts. That's just the tip of the iceberg as decorative bedding accessories are also offered to help you complete the look of your kids bedroom. Choose bedding from a variety of sizes that include twin, full, queen and king size for kids of all ages and sizes. Ava is a great floral girls bedding that features a bedskirt made of layers of crushed vanilla taffeta designed to cascade to the floor under a sheer floral, sequin embellished overskirt. Sheer floral fabric has a dimensional flower applique and is lined with ivory moire. Ivory cording adds the finishing touch for a dramatic and luxurious statement of style. The Isabella collections decorative tassels and cord which are embellished throughout this toile bedding set will delight any girl. A unique arrary of toile fabric in a lovely combination of pink and green including a touch of soft velvet, star jacquard, woven gingham, embroidered rosebuds and sheer stripes make up this wonderful girls toile bedding set which consists of duvet cover, bed skirt and pillow shams. This toile bedding set is available in twin and full size duvet cover, pillow shams and bed skirt with matching accessories to complete your girls room. 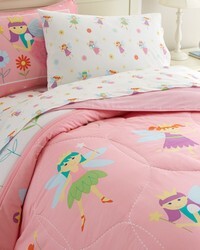 Bedding so Tweet for your little girl. Lovely robins egg blue with cute birdies, lovely owls, happy flowers and sweet birdhouses and butterflies. Everything little girls love including comforter sets, plush pillows, rugs, clock and lamp to complete the look. Colorful butterfly girls room bedding includes toddler bedding, full size and twin size comforter sets for creating a lovely little girls bedroom. 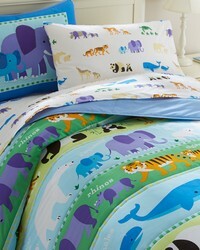 Pandas and Polar Bears, Elepahnts and Cheetahs, Turtles and Tigers are on parade in this boys bedding sets. Comforters, Duvet Covers, Sheets and Rugs help you choose what you need for your boys room. Lovely Fairy Princesses with beautiful crowns and lovely star wands on a pink background create a perfect little girls room bedding ensemble. Toddler, Twin and Full size comforters with rugs and other matching accessories. 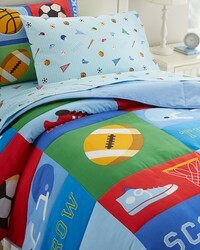 Sports themed bedding in toddler, twin and full size. Boys bedding for the all around sports kid - basketball, basebal, football, soccer and more. Celebrate those who keep us safe, our heroes include poliemen, firemen, and first responders. 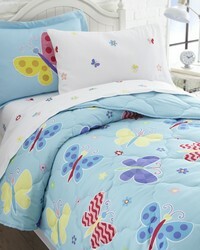 Blue comforter is soft microfiber and comes in full, twin and toddler sizes. 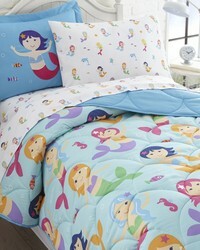 Brightly colored mermaids swim with dolphins, turtles, sea horses and fish friends. Bright blue background made of extra soft microfiber. 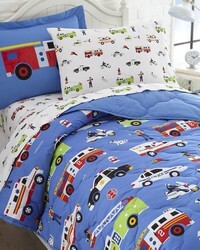 Comforter sets in toddler, twin and full sizes. 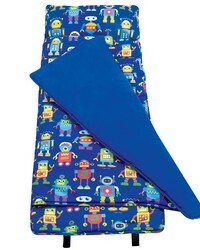 Cute monsters on a medium blue background will create a fun boys room. The playful bedding sets come in a range of sizes including toddler bed, twin and full size. Blue tonal stripes sport all types of things that go: hot air balloons, boats, cars, trucks, and planes. 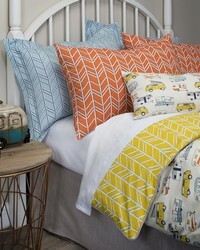 Fun boys room bedding sets to create the kids room you want for your little boy. Your little astronaut will rocket into orbit with this classic outer space design! 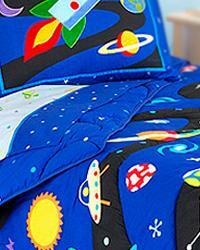 The Out of This World kids bedding is 100% ultra soft cotton Percale! The comforter has a galaxy of planets, rocketships and comets against a swirly space background. The reverse on the outer space comforter is a starfield on blue. The ultra soft, 200 thread ct. bed sheets are light blue with all the colorful space icons. The hem is a sewn on row of stars with a ribbon trim. The sham has appliqued soft plush with embroidered details. Kids bedding at its best! Ahoy! Matey. 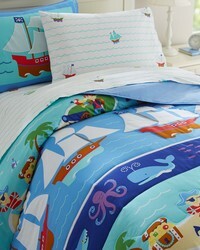 Be on the lookout for Pirate treasure in this bright and bold boys bedding set. 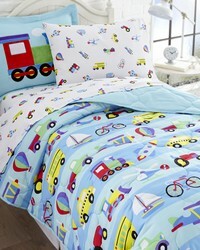 Comforter Sets, Duvet Covers, Toddler Boy Bedding with matching accessories like rugs, clocks, and sheet sets. The classic "Trains, Planes & Trucks" is ideal for little boys on the go! What little boy could resist these colorful trains, airplanes & trucks? Comforter with coordinating bedskirt, shams, bed sheets, curtains with matching valance and shower curtain among other great accessories. Available in toddler, twin, full and queen sizes. Your boy will love them! 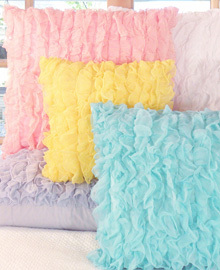 Fun decorative pillows for your kids room. Add a splash of color and style with this selection of kids accent pillows and kids throw pillows. The Pixie Aqua features a soft and whimsical HUGE paisley pattern in gorgeous pinks and aqua. Aqua and white polka dot lamps, rugs and wall art are offered to beautifully coordinate with the duvet cover. Valance and bed skirt feature cute pink bows. Cute prints sleeping bags and nap mats. Perfect for daycare, preschool and family camping trips. This super stylish zebra bedding sets come in 5 of the coolest colors including pink, lime, black and white, brown and ivory and lavender with black! These complete bedding sets include coordinating comforter, pillow shams, bed skirt and complete bed sheet set consisting of pillow case, fitted sheet and top flat sheet. Available in a wide range of sizes including twin, twin XL, full, queen, king and california king. Optional coordinating accessories to put that finishing touch on your kids zebra bedroom include window treatments of curtains with valances and decorative pillows. Silvery gray velvet paired with pink and gray chevron for a modern bedding look you are sure to love. Bright and colorful bedding featuring a retro RV print. 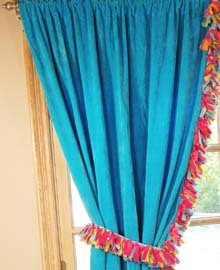 Cute curtains for the kids room. Decorating your childs bedroom can be fun with our selection of cute kids curtains. 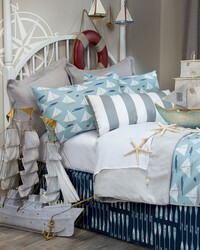 Boy bedding set featrues classic sailboats and a oar print on a deep indigo bacground. Honey bears and blue chevron combine in this wildlife themed baby bedding set. From wall decor to changing pad covers, you will find it all in this set. Dinosaur Land boys bedding by Olive Kids brings colorful dinos, volcanoes and lava to your kids room. Choose from lots of fun accessories to complete the look. Romantic bedding in a subtle ballet pink, this lovely bedding ensemble features faux silk, taffeta, organza with lovely embroidery florals and vines.